A Xamarin and MVVM fan outlines Xamarin Forms and the open source Prism MVVM framework. 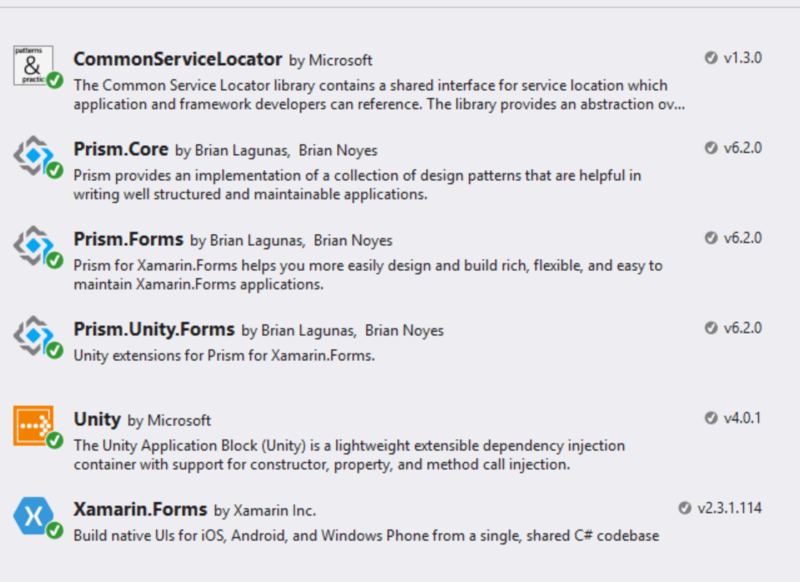 Even though I understand it may not be the right technology for every project, I’m a huge fan of Xamarin Forms. As you’ll probably now if you follow my blog, I’m a Windows Developer and Xamarin Forms allows me to use basically all my current skills (XAML, binding, MVVM, etc.) to create applications also for other popular platform likes iOS and Android. Additionally, it gives me the chance (like with native Xamarin) to take advantage of platform specific features and, at the same time, to maintain a user experience which is coherent with the look and feel of the operating system. I’ve recently used Xamarin Forms to create a porting for Android of my simple Qwertee Shirts app and the advantage was clear: I was able to reuse most of the backend code I’d already written for the UWP version and my XAML knowledge but, at the end, I got an application that fully embraced, from a UI point of view, the new Material Design created by Google so it doesn’t look “alien” like it often happens with cross-platform applications based on web technologies. However, I’m not only a Windows Developer but also an MVVM enthusiast and I’ve blogged about this topic multiple times, covering multiple platforms and frameworks. If you’re new to the MVVM pattern, I suggest you start from this post and move on with the rest of the series. The first thing I did when I decided to resume working with Xamarin Forms was to port my app. I was looking for the best way to reuse my MVVM knowledge to develop the project and, as usual, the choice was hard. In this case, it was even more complicated because Xamarin Forms, compared to other XAML technologies like WPF or UWP, is pretty new, so it was hard to find a choice that completely satisfied me. Don’t get me wrong — if you remember my posts about Template10 for UWP apps, you’ll know that I’m a huge fan of the flexibility offered by MVVM Light and Laurent Bugnion did a superb job to introduce typical MVVM concepts (like binding and commands) in platforms that don’t natively support them, like Android and iOS. However, Xamarin Forms is a bit different than standard Xamarin: it already offers the concepts we need to leverage the MVVM pattern, like binding, data context, dependency properties, behaviors, etc. In this scenario, MVVM Light is still a great choice but you still have to reinvent the wheel to solve many common scenarios you have to deal with when you’re developing an XAML app, like handling navigation, getting access to navigation events in a ViewModel, or passing parameters between one page to the other. Right before starting my porting, I saw a tweet by Brian Lagunas, one of the MVPs behind the Prism project, announcing a new version of Prism specific for Xamarin Forms. Just to refresh your mind, Prism is an MVVM framework that originally was created by the Patterns & Practices division of Microsoft and turned into an open source project driven by the community. Prism has always been a great choice to implement the MVVM pattern in XAML based applications, but sometimes you may have faced the risk to make the project over complicated just to follow its naming conventions and rules (like the requirement of having a bootstrapper to initialize it, despite the fact that XAML based application already have a startup class called App). After completing the porting, I’ve found myself very satisfied with the Prism approach for Xamarin Forms, so I’ve decided to share my experience with you, hoping that it will get you up and running quicker when you start working on a new Xamarin Forms project. Actually, this template has an advantage over the standard Xamarin Forms template. 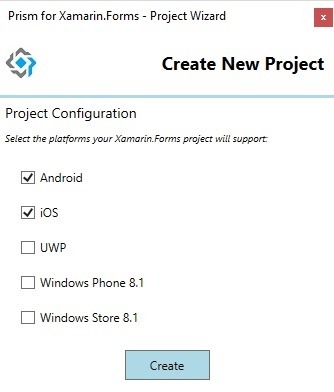 As you can see from the image below, it allows you to choose which platform you want to target when you create your project, while the default Xamarin Forms template automatically creates a project for each supported platforms (Android, iOS, Windows Phone 8.1, Windows 8.1, UWP), even if you aren’t interested in targeting one of them. A ViewModels folder, to place your ViewModels. The templates include a default one, called MainPageViewModel.cs. 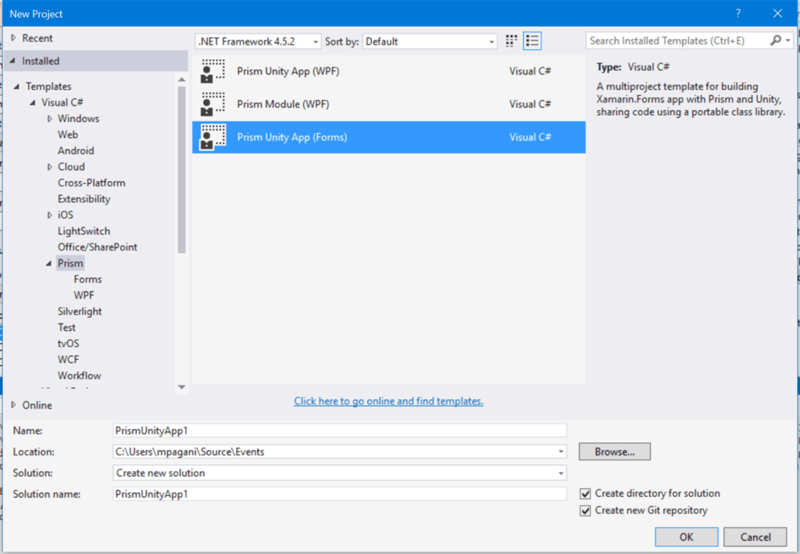 As you can see, other than the standard Xamarin Forms NuGet package, Prism requires two packages: a Core one (which is in common across every platform) and a Forms one (which, instead, contains the specific helpers and services for Xamarin Forms). By default, the standard template leverages Unity as its dependency injection container, so you’ll find a bunch of other packages like Unity, Prism.Unity.Forms and CommonServiceLocator. However, if you don’t like Unity, Prism for Xamarin Forms offers some additional packages to integrate other popular dependency injection containers, like Ninject or Autofac. 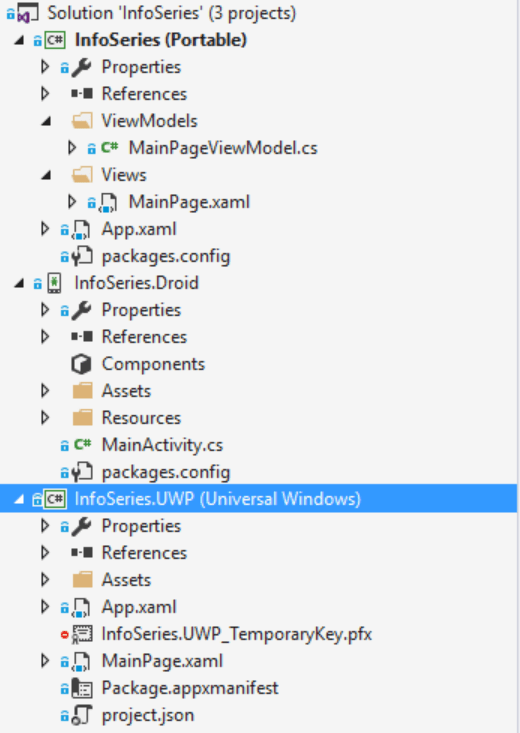 The ViewModel should be stored in a folder of the project called ViewModels and it needs to have the same name of the page plus the suffix ViewModel (so, for example, the ViewModel connected to the MainPage.xaml will be called MainPageViewModel). As you can see, this is the exact infrastructure that the Prism template has created for us. Every page that we add to our application needs to be registered in the container so that we can properly handle the navigation. To register it, we can leverage the RegisterTypes() method of the App class and use one of the methods offered by the Container called RegisterTypeForNavigation<T>, where T is the type of the page. In the starting template, we have just one page called MainPage, so it’s the only one that is automatically registered when the application starts. Here is one of the biggest differences between Prism and other MVVM frameworks. With other toolkits, you are used to register in the container only the ViewModels and, eventually, all the services related to them. With Prism, instead, you just register the page’s type: it’s up to Prism to automatically register in the container also the ViewModel connected to the View. As you can see in the sample code, we have registered the MainPage class and not the MainPageViewModel one. In the OnInitialized() method you can see a preview of how navigation works by default: every time you call the RegisterTypeForNavigation<T> method, Prism registers into the NavigationService a reference to that page using, as key, a string with the same type name. Since our page’s type is MainPage, we need to pass the string “MainPage” as parameter of the NavigateAsync() method to trigger the navigation to that page. If we want to override this behavior, we can pass as parameter of the RegisterTypeForNavigation<T>() a custom string and use it for the subsequent navigations, like in the following sample, where we have replaced the key “MainPage” with the “MyCustomPage” one. However, in the next posts, we’ll see more details about how to handle navigation in a more advanced way. This property takes care of connecting the View with the ViewModel: when it’s set to true, the ViewModel will be automatically set as BindingContext of the View if we have respected the naming convention previously described. However, one of the changes introduced in Prism 6.2 is that this property isn’t required anymore unless you want to explicitly disable the naming convention by setting it to false. The standard template adds it to give a more complete sample, but you can safely remove it. Thanks to this class, whenever we need to create a property that implements the INotifyPropertyChanged interface (so that it can propagate its changes through the binding channel) we can simply use the SetProperty() method in the setter of the property. This method will take care of storing the value and, at the same time, sending a notification to all the controls that are in binding with this property that its value has changed, so they need to update their layout. The sample app created by the template does exactly this: it creates a property called Title, which is connected through binding to a Label control in the XAML page. Whenever we change the value of the property, we will see the UI updated in real time. To be honest, the sample app shows something else too: it sets the value of the Title property in a method called OnNavigatedTo() and it parses some parameters. We’re going to see how this approach works more in details in the next post. In this post, we have just scratched the surface and we showed the basic concepts behind a Xamarin Forms application created with Prism. In the next post, we’ll see some more advanced concepts, like handling navigation in a ViewModel or registering additional services in the dependency container. Published at DZone with permission of Matteo Pagani , DZone MVB. See the original article here.